Malvina Reynolds wrote a song called little boxes way back in 1962. I have been living in an established neighborhood that grew over time for the last 14 years. Some of the houses look the same, but most are different. They have been added on to, remodeled, different builders came in and built newer style homes, empty lots were filled with custom homes in more recent times, and the trees and landscaping have matured. As we now get ready to move into a still being developed neighborhood I can already feel the need to make my house a little more me. I jokingly call the house my builder basic beige home in the burbs. It really is pretty and I do mean really pretty. But it is tan, and beige, and brown, and more tan, and beige and brown. ( the color of moving boxes!) My very adorable realtor told me it makes the homes more sale-able. HMMM. I am not saying she doesn’t know her stuff, she does….but it was a real turn off for me. I know I can’t live with the flat beige walls in every room for very long. Project number 1 will be to make the powder room in the entry more fun. It is a simple two piece powder room that is a nice size. It will be used by guests, so I want it to be snazzy. I am really looking to create the feel in this home that it has been around a while, not built 10 minutes ago. 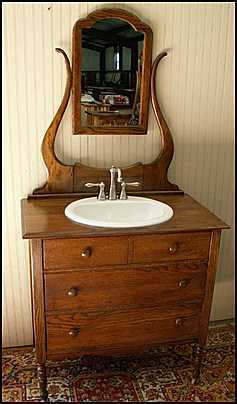 I am already shopping every day for just the right small dresser and mirror to turn into a vanity for the sink. Anyone have one of these beauties laying around that you wouldn’t mind me cutting a hole in and permanently installing in my bathroom? The hunt is on. I am definitely going to stencil this room. I think it will be painted with flat paint then stenciled with the same color in gloss. The cabinet above the toilet must come down so that something fun can go there. ( Who needs a cabinet above the toilet that even in the description is called a head knocker?) That cabinet is going into the laundry room which will be my second project. The powder room needs a great light too. I think my milk glass chandelier may have a new home! We better close on the house soon! Boxing up is boring.